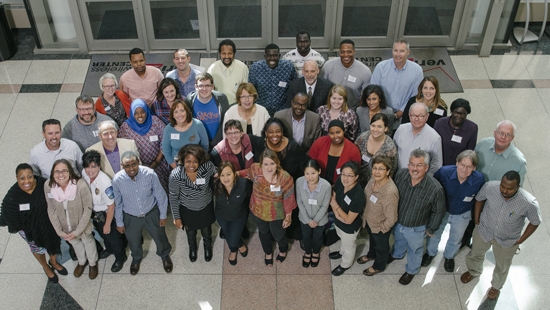 OWATONNA, Minn., January 21, 2016 - Nearly 50 residents of the Mankato area completed a two-month community leadership training program provided jointly by Blandin Foundation, Bush Foundation, and the Southern Minnesota Initiative Foundation. Leadership in Ethnically Diverse Communities (LEDC) develops the leadership capacity of all community members in ethnically diverse communities for the purpose of building intentional inclusion. A program of Grand Rapids-based Blandin Foundation, LEDC has provided experiential leadership training for more than 350 community leaders from seven rural Minnesota communities. This is the first time Mankato area residents have participated in the LEDC leadership program. Mohamed Abdulkadir, Yakub Aden, Sharif Ahmed, Mohamed Alsadig, Christie Asomani-Boateng, Maria Baxter-Nuamah, Sarah Beiswanger, Jeremy Burger, David Brave Heart, Dawn Campbell, Pratibha Dhamala, Barb Dorn, Denny Dotson, Ted Downey, Abdi Khalif Farah, Joe Farnham, Lyle Femrite, Gladys Frydendall, Cheryl Hamond, Bukata Hayes, Melanie Helling, Mohamed Ibrahim, Tiffnie Jackson, Fardousa Jama, Mary Kok, Seung Heon Lee, AmyJo Lennartson, Mary Kate Lewis, Josh Milow, Abdulkadir Mohamed, Ayan Musse, Anatasia Nela, Justin Neumann, David Ngor, Diane Norland, Jessica O'Brien, Travis Olson, Augustino Omot, Amal Osman, Macey Page, Samuel Thokwath Rik, Ahmed Shiiraar, Kim Spears, Meg Steuer, Amanda Vang, Paul Vogel, Amy Vokal, Miho Woelfel and Bradley Wolfe. The goal of LEDC is to develop the leadership capacity in ethnically diverse communities for the purpose of building intentional inclusion. Topics covered during the program included: understanding culture and its role in building relationships, culturally specific differences of conflict interaction styles and their impact, working in partnership with other participants to build and strengthen relationships, and developing plans to engage in the community in ways that promote inclusion. "A healthy community depends on leadership engagement of community members," said Valerie Shangreaux, director of Blandin leadership programs. 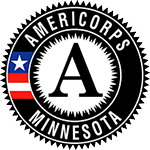 "The leadership demonstrated by these participants reflects their commitment to their community, as well as to the region and to rural Minnesota." This LEDC training program was jointly funded by Blandin Foundation, whose mission is to strengthen rural Minnesota communities, especially the Grand Rapids area, Bush Foundation, which invests in great ideas and the people who power them in Minnesota, North Dakota and South Dakota, and the Southern Minnesota Initiative Foundation, whose mission is to promote regional economic opportunities and collaborations with a focus on entrepreneurs and early childhood development. Blandin Foundation works for vibrant rural Minnesota communities by investing in community leaders and working with partners to expand opportunity for all residents. Located in Grand Rapids, Minn., it is one of only a handful of foundations in the U.S. focused exclusively on rural communities and the largest rural-based private foundation in Minnesota. Information on Blandin Foundation grant-making, leadership development programs and public policy initiatives: www.blandinfoundation.org. The Bush Foundation invests in great ideas and the people who power them. The Bush Foundation encourage individuals and organizations to think bigger and think differently about what is possible in communities across Minnesota, North Dakota, South Dakota and the 23 Native nations that share the same geographic area. To learn more, visit www.bushfoundation.org. Southern Minnesota Initiative Foundation (SMIF), a donor-supported foundation, invests for economic growth in 20 Minnesota counties. The Foundation has provided more than $55 million in grants and loans within the region during the past 29 years. SMIF's key interests include early childhood and economic development. To learn more about our work and mission, visit www.smifoundation.org.